GIA Wellness provides protection against electromagnetic radiation from cellphones, computers and all wireless devices. Electromagnetic radiation (EMR) emitted by Cellphones, PDA's, Bluetooth headsets, Wireless internet etc. has been linked to various stress-induced health issues. We subject ourselves to this overbearing external stressor every day. 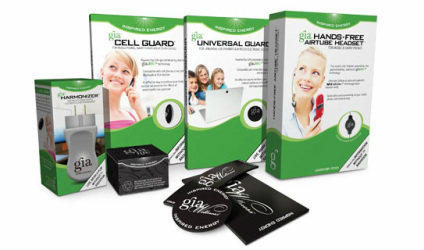 The GIA Cell Guard allows you to use your Cellphone, Smart Phone, Bluetooth with the peace of mind you deserve. Utilizing the proprietary GIAplex™ technology, the GIA Cell Guard actively works to neutralize the effects of your exposure to harmful radiation and is designed to strengthen the body's resilience to stress at the same time. Terragia - Guards designed to neutralize the effects of radiation from cellphones, computers and electronic devices. Terragia - Personal pendants to be body worn and home/office harmonizer to plug in and protect your environment. Aquagia - Hydration with scientific validation which transforms water's molecular structure to super hydration linear formation. Water is then changed to provide 600 x more viscosity than normal water to penetrate on a cellular level. GIAplex™ combines the benefits of the patented noise field technology MRET™ (Molecular Resonance Effect Technology), and GIA's proprietary subtle energy technology ERT™ (Energy Resonance Technology). The combination of these two groundbreaking technologies offer an effective way to deal with the cumulative stress associated with living in today's electronic and wireless environment.